So it seems to the wider world that Oscar Pistorius has got off lightly with his conviction of culpable homicide although we won’t know to what extent he ‘got away with it’ until we hear Judge Masipa’s sentence in October. However, the judgement handed down by Masipa is bound to raise more than a few eyebrows for a number of reasons. The detailed judgement readout by the Judge was devoid of many material facts as she said at the outset, she was not going to rehash the evidence. By not going into detail about key planks of the evidence, she has left many legal professionals and lay observers wondering how she could have arrived at the judgement she did. 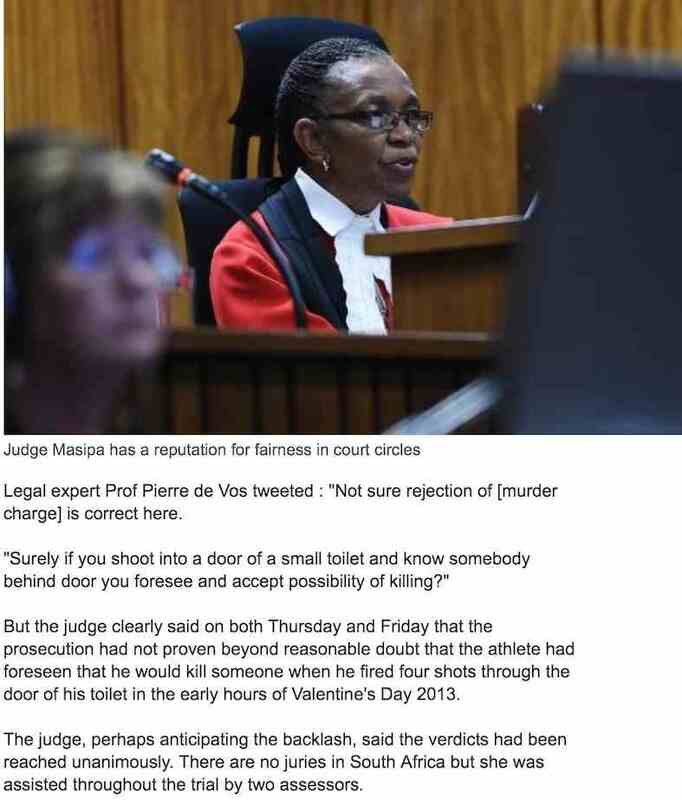 How can Judge Masipa determine that the accused was negligent in shooting through the toilet door and then find that he couldn’t possibly have appreciated that, in the act of shooting in such a confined space, there was a strong possibility that whoever was in the cubicle, could be killed? She said in her ruling that, ‘he was a poor witness’, The athlete, who became emotional on Thursday after being described as an “evasive witness”, seemed to have been expecting this verdict. The judge had already spoken of his negligence and use of “excessive force” when he fired through the door. Although he was acquitted of the most serious charge, culpable homicide still carries a prison term of up to 15 years but, unlike murder, the judge may use her discretion and suspend the sentence or only impose a fine. If the judge gives a fine or some sort of ‘house arrest’, one feels Masipa will come under heavy criticism. The global nature of this trial ensures a level of scrutiny, which will only reflect badly on the South African justice system. It seems strange that Masipa dismissed out of hand, the evidence of the majority of witnesses when it surely can’t be the case that every witness was confused or disorientated about the happenings that morning. There is a long way to go on this case yet. I have a lawyer friend who says that Masipa has gone for the ‘safe option’ in dismissing witnesses, ignoring why Reeva made not a single noise in the face of events that night, why there was a light on in the bathroom, virtually ignoring the fact that the accused was defensive and unreliable as well as argumentative. It seems that Masipa has made her rulings on the more serious of the indictments, based on ‘technicalities’. My lawyer buddy thought from the very start that OP would get convicted of culpable homicide and would get 7 to 10 years. How right he may yet prove to be! 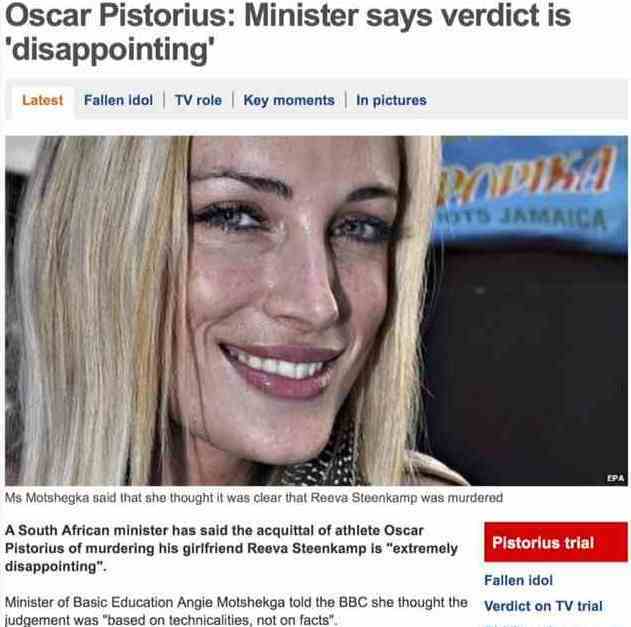 « Did they get Oscar Pistorius off lightly?